The Z1 Dashboard software allows for a lot of customization of each car's dashboard. This customization is done using the Settings Dialog, accessible by clicking the Settings Icon when not in the car. There will be four tabs associated with the car, Car 1, Car 2, Car 3 and Car 4. Each is described below. A Note For Stock Cars Using Impala Style Dashboards. The pit speed limit lights on Impala style dashboards can be customized using the shift light fields located in the Car 3 tab. See here for full details. Remember that you can have up to 10 dashboards associated with each car. With this in mind, you can specify which dashboard appears in which order for the specific car. Each dashboard can then have its own customized information. Remember that you can run multiple instances of the software. With this in mind, you can also specify different dashboard configurations for a specific car for each instance. Most of the time, however, it is easier to define the car just once for the first instance (see below) and then use the default dashboard option to display track maps or telemetry data, etc, for all other instances of the software. This first tab allows you to specify the general settings used for the car. It includes options that are global to all dashboards used for the car. The name of the sim and car being edited are displayed at the top of the dialog to ensure you are editing the correct car. This is the name of the sim whose cars you want to edit. This is the car that you want to edit. Note that while the Z1 Dashboard comes with a list of many of the cars available in all the sims, due to the number of cars available it is possible that your car is not displayed here. If that is the case, then you will need to drive the car once in order for it to show up in this list. After that it will be available as an option. If you tick this checkbox then when you save the current car definition, by clicking the OK button, the definition will be saved for all cars in the currently selected sim, including the default dashboard. This allows you to very easily make a specific dashboard layout and assign it to all cars. Note that if you do this it will overwrite all other car definitions for the sim. This is the name of the car as it should be displayed in the garage screen. By default the software will try to determine the redline of the car based on information supplied by the sim. However, sometimes the supplied information can be incorrect. Settings this to No will allow you to manually enter the redline for the car. This is the redline for the car. If you have the Auto Redline option set to Yes then you cannot change this as it is set by the sim. However if the Auto Redline option is set to No then you can enter your desired redline value here. This tells the software which laps to use when calculating average lap times. This is useful for timed races in order to determine the number of laps remaining in the race. However there are certain conditions that can cause inaccuracies during a race, such as running under yellow flags or pit stops, etc. 1) Use All - this is the default. It uses all laps to determine your average lap time. 2) Within X% - This option only includes those laps that are within X% of the average lap time. This will allow you to not include yellow laps or pit laps (or other unusually slow laps). The first three laps of the race are used to determine a base average lap time. The specific percentage is placed in the text field as a whole number. As an example if your first three laps average 60 seconds, and you have set this value to 10, then any lap over 66 seconds will not count towards your average lap time. 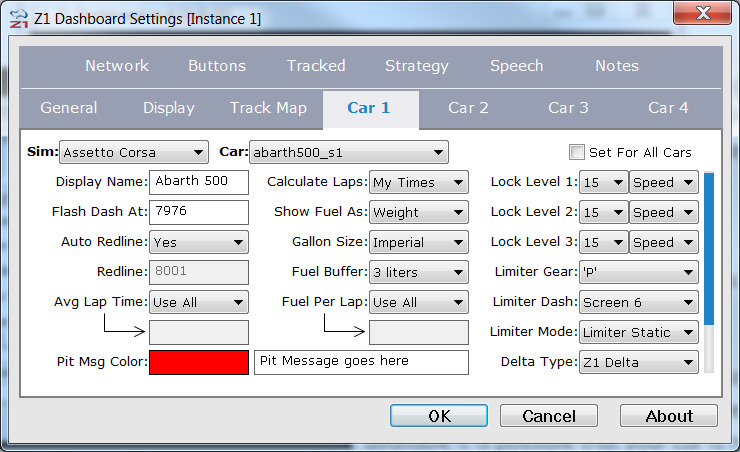 3) Previous X - This option tells the software to determine the average lap time based on the previous X laps. This is useful if you want to include yellow flag periods in your average lap times when they are running, but then want to discard them when you go back to green flag running. This is the foreground color of the message that is displayed in the pit info dashboard. Clicking the swatch will display a color chooser which allows you to select the desired color. This is the message that will be displayed in the pit info dashboard if it is used. The Z1 Dashboard will display yellow flags and blue flags on the dashboards by flashing the background. You can turn this option off by settings this to No. The adjustment value of rear and front wings can be numbers (1,2,3...) or a distance (1mm, 2mm, 3mm...). If the wing adjustment numbers are not displaying correctly in the Adjustment Dashboard then it is most likely because this option is set incorrectly for the car. This option allows you to specify how the number of laps remaining in a timed race are calculated. The two options are Leader Times and My Times. Most of the time you should use Leader Times. This uses the leader's lap times to determine the number of laps remaining in the race. Because they are faster than you (unless you are the leader) they may be able to do more one more lap than you will be able to do in the time remaining. This means you will also have to complete that additional lap, and this will impact fuel consumption. This determines how the fuel is displayed in the dashboard for this car. There are two options: Weight, which displays the fuel as either pounds or kilograms; or Amount, which displays the fuel as either gallons or liters. This determines which gallon measurement to use. It can be either Imperial or US. This is only applicable when using imperial units and showing the fuel as an amount. When calculating the amount of fuel required to finish a race the Z1 software will specify only just enough fuel to get you ot the finish line. Sometimes this may not be quite enough if you use more fuel than expected after your pit stop. So by setting a fuel buffer, you can tell the software to add the specified amount of fuel to its calculations. The default amount is 3 liters. By default the Z1 Dashboard software will calculate the amount of fuel used per lap by averaging a certain number of laps. However that can sometimes cause inaccuracies, especially if you are under a long full course caution. 1) Use All - This is the default option. It uses all laps to determine the amount of fuel used per lap. 2) Previous X - This uses the previous X laps to determine the average fuel consumption. You specify the number of laps in the text field as a while number (ie 5 to use the last five laps). 3) Use Amount - Enter any number in the text field and the software will use that exact amount of fuel for the average amount per lap. This number should be in the same units as those displayed by the car. For example setting it to 2.5, when you use liters as the fuel display, will mean the software will calculate fuel amounts based on you using 2.5 liters per lap. This determines how long the last lap time will be displayed after crossing the start/finish line (in milliseconds). Certain dashboard allow you to utilize the three left and three right LEDs to show if your front wheels are close to locking up. The sensitivity of this feature is controlled using these three Lock Level lines. Lock Level 1 controls the outermost LED, Lock Level 2 controls the middle LED, and Lock Level 3 controls the inner most LED of the three. Each of the three can be set to Speed or Prcnt (percent). The number value is the amount of either speed or percentage difference between the from wheel and the rear wheel. Once that difference has been exceeded the LED will illuminate. Note settings the value to zero will turn the feature off. Also note that you need to have at least 15% of brake travel engage for the feature to be engaged. As an example if you have the Lock Level 1 set to 15 and speed and your units are set to KPH, then if the front wheel is turning at least 15 KPH slower than the rear wheels then the outermost LED will illuminate. Another example would be using the Prcnt option. This allows you to have a variable difference in speed between the front and rear wheels. As your speed increased the difference between the front and rear wheels has to be higher than at a lower speed to illuminate the LED. This allows you to specify how the gear indicator should display information when the pit limiter is engaged. The options are 'P' of Gear. The 'P' setting will display a P when the pit limiter is engaged regardless of the gear you are in. The Gear option will display the actual gear you are in when the limiter is engaged. This indicates which of the dashboards associated with this car will be displayed when the pit limiter is engaged. Selecting None means that engaging the pit limiter will not select a specific dashboard. This determines when the selected pit limiter dash is displayed. There are four options: 1) Limiter Static - This is the default. The pit limiter dash will be displayed when the pit limiter is engaged. When the pit limiter is turned off the dash will return to the dash displayed before the limiter was engaged. 2) Limiter Change - The pit limiter dash will be displayed when you engage the pit limiter. You may then change the dash to a different one at any point. Turning off the pit limiter does not restore the original dash. 3) Pit Lane Static - This pit limiter dash will be displayed when you enter pit lane. When you exit pit lane the dash will return to the dash displayed before you entered pit lane. 4) Pit Lane Change - The pit limiter dash will be displayed when you enter pit lane. You may then change the dash to a different one at any point. Leaving the pit lane does not restore the original dash. There are times, though, when using the leader's lap times would not make sense, such as a multi class race where the leader of the race is in a different category from you. In this case you should use My Times to get a more accurate number of laps remaining in the race. By default the Z1 Dashboard software will calculate the the delta using its own data. This allows for accurate deltas in all of the sims. However some sims offer their own delta timing options. You can specify that one of these should be used by the Z1 Dashboard when running the sim. To do so, just select the desired option from the drop down. Some of the analogue dashboards have additional information, such as lap times, positions, etc that can be displayed. Settings this option to Yes ensures that information is displayed. Setting it to No will only display the analogue information on those dashboards. This second tab allows you to specify the various items that are specific to the current dashboard and screen. 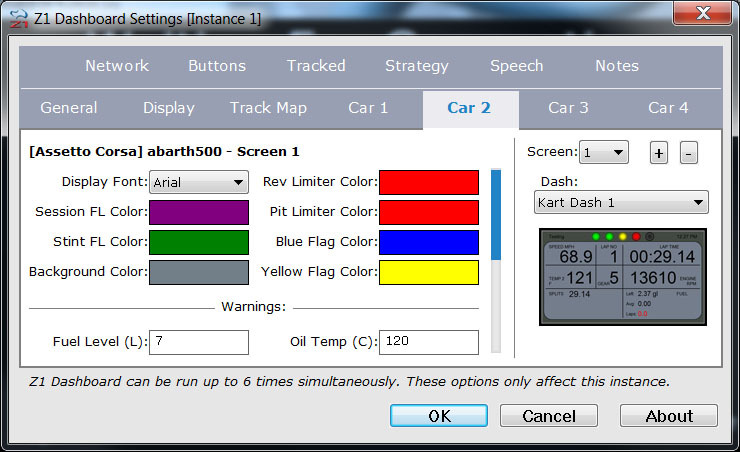 As with the first tab, the name of the sim and car being edited are displayed at the top of the dialog, along with the screen number, to ensure you are editing the correct car and screen. This drop down allows to to select which of the 10 dashboards associated with this car you would like to edit. Note that even though the car can have up to 10 dashboards associated with it, this drop down will only display numbers for the currently defined dashboards. To add an additional dashboard, press the plus (+) button. To remove the currently selected dashboard, click the minus (-) button. This is the dashboard that should be displayed for this car and the currently selected screen. The drop down includes all available dashboards. Selecting one of them will change the preview dashboard icon to help in the selection process. When you change a dashboard there are several other settings which will be automatically updated. They are: Display Font, Background Color, Tach RPM, Tach Color, Oil Flash, Water Flash, and all shift light colors and RPM ranges. This happens to help make sure that the dashboard displays as intended. This is the font that is used when displaying information on the dashboard (RPMs, Speed, etc.) This mostly applies to the road car dashboards, as the oval car (and a few of the road cars) use dials to display information. This is the color that is used to display the lap time on the dashboard when it is your fastest session time. Clicking the swatch will display a color chooser which allows you to select the desired color. This is the color that is used to display the lap time on the dashboard when it is your fastest stint time. Clicking the swatch will display a color chooser which allows you to select the desired color. This is the background color of the dashboard for the car. Clicking the swatch will display a color chooser which allows you to select the desired color. This is the color that the background of the dashboard will become when the rev limier is engaged. Clicking the swatch will display a color chooser which allows you to select the desired color. This is the color that the background of the dashboard will become when a blue flag is present. Clicking the swatch will display a color chooser which allows you to select the desired color. This is the color that the background of the dashboard will become when a yellow flag is present. Clicking the swatch will display a color chooser which allows you to select the desired color. The following five settings only effect the stock cars that use the Impala style dashboards. If this checkbox is ticked then the software will determine when to illuminate the pit lane speed limit LEDs within the tachometer based on the speed limit of the track. Note this is only possible if the sim returns the track's pit lane speed limit. On the oval cars with tachs that can change colors, these values specify the RPMs at which the tach changes to the next color. It is a comma separated list of 4 RPM levels. 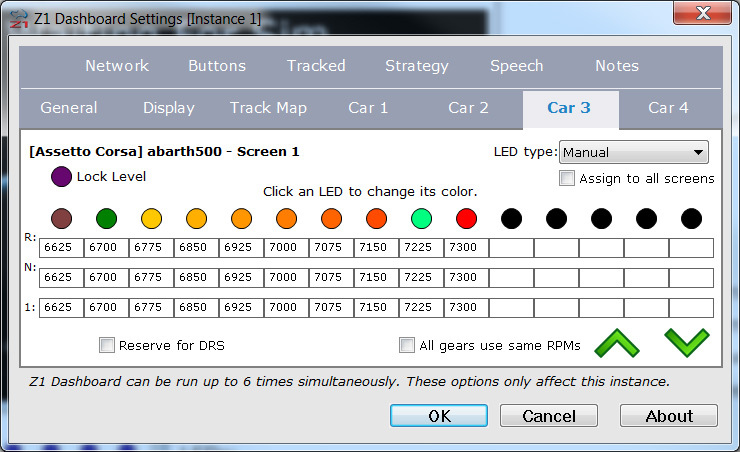 On the oval cars with tachs that can change colors, these values specify the color for each RPM range. There are five RPM ranges, and as such this is a comma separated list of those five colors in hex format. On some of the oval cars, the oil temperature gauge will flash once the oil temperature exceeds a certain value. This setting specifies that value in degrees fahrenheit. On some of the oval cars, the water temperature gauge will flash once the water temperature exceeds a certain value. This setting specifies that value in degrees fahrenheit. This third tab allows you to specify the color and rpm illumination of each of the shift lights on the dashboard. As with the first tab, the name of the sim and car being edited are displayed at the top of the dialog, along with the screen number, to ensure you are editing the correct car and screen. This is the color that will be used to illuminate the LED when the lock level feature is engaged. This is a representation of the LEDs used in the display. If the LED shows as black then it is not used for the selected dashboard. To change the color, click on the LED and use the color chooser to select the desired color. This defines how dashboard shift lights will illuminate. There are five options. Using any option besides manual will override any RPM limits you enter into the various gear text fields. Manual: You will specify how they illuminate in text fields. There is a box underneath each LED. This is used tp specify the RPM at which that LED should illuminate. You can only make changes to these values if you have selected 'Manual' from the LED type drop down. Any other choice will automatically determine the values based on the selected choice. If this box is ticked then the LED pattern will be assigned to all screens associated with this car. This is useful if you are using a complicated shift pattern for an F1 style dashboard and want to easily copy it across all the F1 screens used by this car. Note this only copies it to this car, and not any other car. If this box is checked then you will only see one row of boxes underneath the LEDs. The values entered into that one row of boxes will be used for all gears in the car. If this box is not checked, then you will see multipple rows of boxes allowing you to enter specific RPMs for each gear. You can use the green up and down arrows to navigate through the gears. Checking this box reverses the left 5 LEDs for DRS usage. Note this is only applicable to the F1 dashboards and the SMZ1 wheel. All the Impala style dashboards include seven lights within the tachometer. These lights illuminate at specific RPM ranges to help you maintain the pit lane speed limit. As you approach the pit lane speed limit the lights illuminate sequentially through three color groups. The default color groups are yellow, followed by green, and finally red. You can customize those colors by selecting the desired colors for the first three LEDs. There are three sets of RPM ranges for these lights: one for the yellow phase, one for the green phase, and one for the red phase. In sims that provide the pit lane speed limit these RPM ranges will be set automatically to provide accurate illumination based on the speed limit. 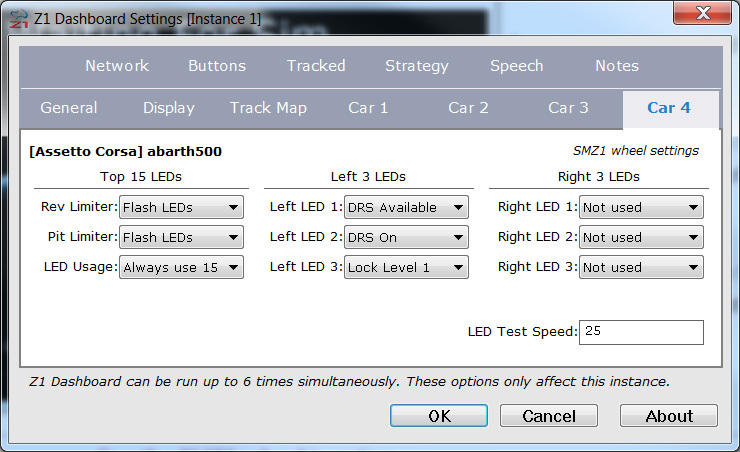 For tracks or sims that do not include the pit lane speed limit, you can manually set the RPM range for the LEDs. Each phase (yellow, green and red) contains 8 RPM numbers. The 8 RPM numbers should be entered in gears 1, 2 and 3 in the first 8 RPM boxes. The first light will be illuminated between the first and final indicated RPM in the list. The second light will be illuminated between the second and final indicated RPM in the light, and so on. Make sure you have the LED type set to manual. The RPM ranges for the first phase (yellow by default) should be placed in the 1st gear row. The RPM ranges for the second phase (green by default) should be placed in the 2nd gear row. The RPM ranges for the third phase (red by default) should be placed in the 3rd gear row. then the first light will illuminate in yellow between 2500 and 3125 RPM. The second light will illuminate in yellow between 2600 and 3125 RPM. This fourth tab allows you to specify various settings used with the SMZ1 wheel. This allows you to specify what the top 15 LEDs do when the rev limiter in engaged. The options are to do nothing or to flash all 15 of the LEDs. This allows you to specify what the top 15 LEDs do when the pit limiter in engaged. The options are to do nothing or to flash alternating LEDs. See the SMZ1 wheel in action. Many of the dashboards do not have 15 LEDs included in their design. This option allows you to specify what should happen in those cases. The 'Always use 15' option will override the dashboard's design and allow you to use all 15 of the LEDs on the wheel. This is the default. The 'Base On Dash' option will only use the number of LEDs that are included in the dashboard design. This could give you a more realistic LED illumination, but might not use all 15 of the LEDs available on the wheel. This allows you to specify when each of the left 3 LEDs are illuminated. The options for each LED are: Note Used, DRS Available, DRS Active, DRS On, Yellow Flag, Blue Flag, Pit Limiter, Water Temp Warning, Oil Pressure Warning, Fuel Pressure Warning, Low Fuel Warning, Lock Level 1,2,3. This allows you to specify when each of the right 3 LEDs are illuminated. The options for each LED are: Note Used, DRS Available, DRS Active, DRS On, Yellow Flag, Blue Flag, Pit Limiter, Water Temp Warning, Oil Pressure Warning, Fuel Pressure Warning, Low Fuel Warning, Lock Level 1,2,3.